Three young athletes are travelling to Ennis on Saturday and Sunday next to take part in the Munster Juvenile U/9-U/13 Championships. 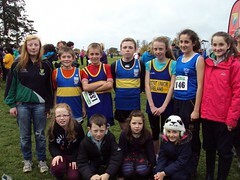 These are Alana Spillane, Sean Boland and Saoirse Doran who compete in the U/10 and U/11 age categories. Competition includes sprints, middle distance and long jump and we send them our best wishes for the weekend. The girls are competing on Saturday with Sean competing on Sunday.